There are so many reasons to share a gift brimming with gourmet snacks. First are exceptional Royal Verano® Pears from our orchards, then sweets like irresistible Moose Munch® Premium Popcorn from our kitchens, and buttery raspberry galettes from our bakery. There are tempting savory snacks as well, including our popular pepper and onion relish and sharp white cheddar cheese and crackers. 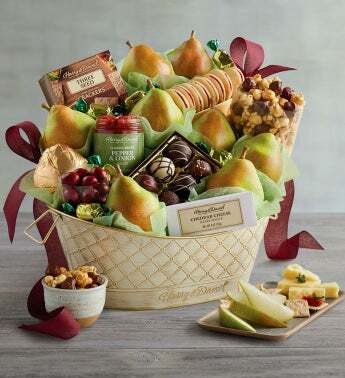 The reusable, festive basket is topped with a hand-tied bow.